In the dead of winter, all I dream about is spring – green, fresh, and flavorful things to get me through. 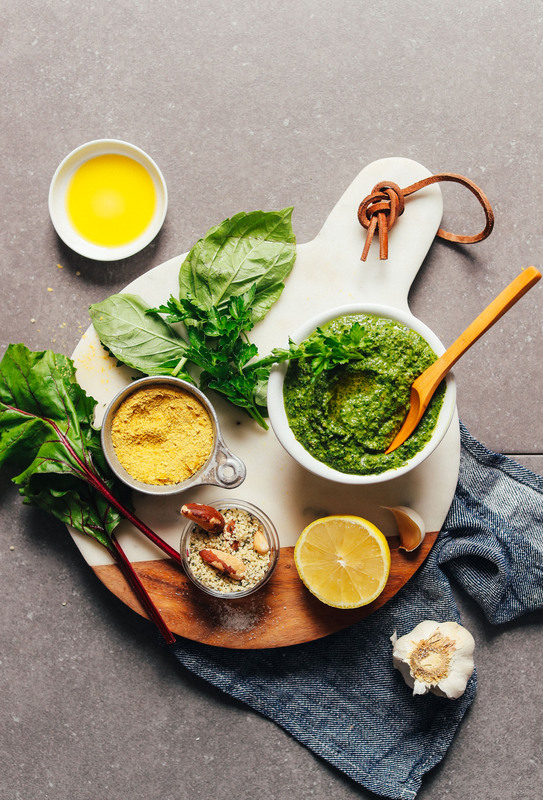 Like this super-vibrant, super-green kale pesto. 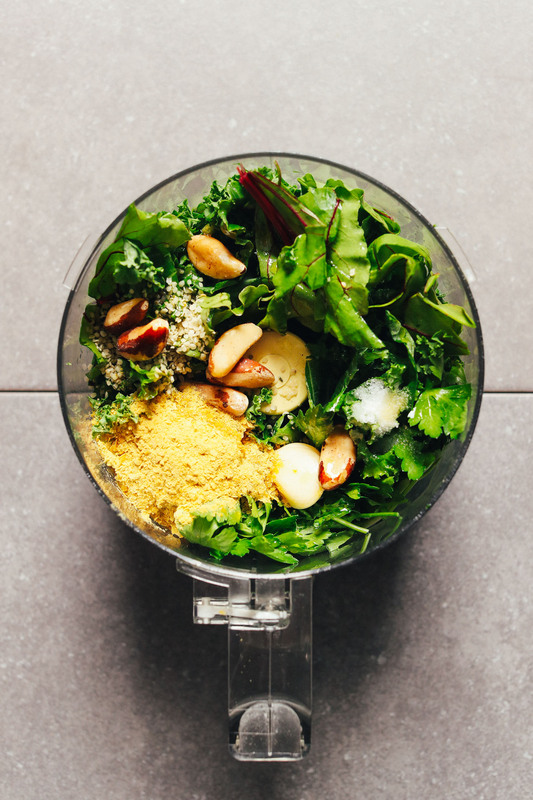 It’s easy to make, incredibly versatile depending on what greens and nuts you have on hand, and BIG on flavor. Put this magical sauce on anything to make it 1,000x more delicious. This recipe requires just 10 minutes, 1 bowl, and 9 ingredients to make. 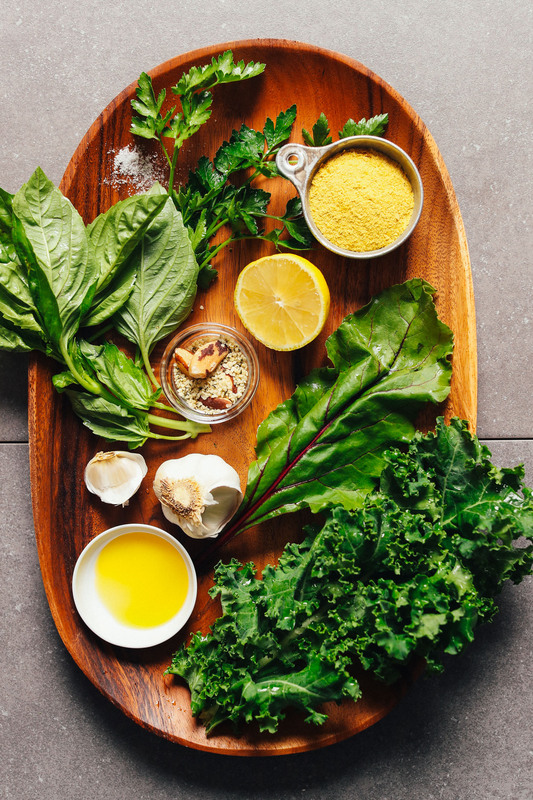 The base is whatever greens you have on hand – such as kale, collards, or beet greens – and fresh herbs. 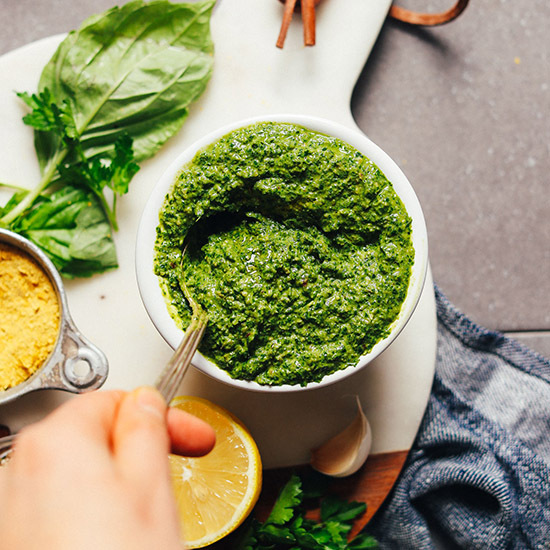 I love the taste of fresh basil and parsley in pesto, so I suggest both. Feel free to customize with whatever greens and herbs you have on hand. Next comes your nut or seed of choice – I went for brazil nuts and hemp seeds. Then add lemon for acidity, garlic for flavor and kick, nutritional yeast for cheesiness, and salt for overall flavor. To keep this recipe oil-free, sub the olive oil for water. Or mix a little of both, which I prefer doing. That way, you get a bit of that creamy texture without adding too much oil. A quick blend and bam! 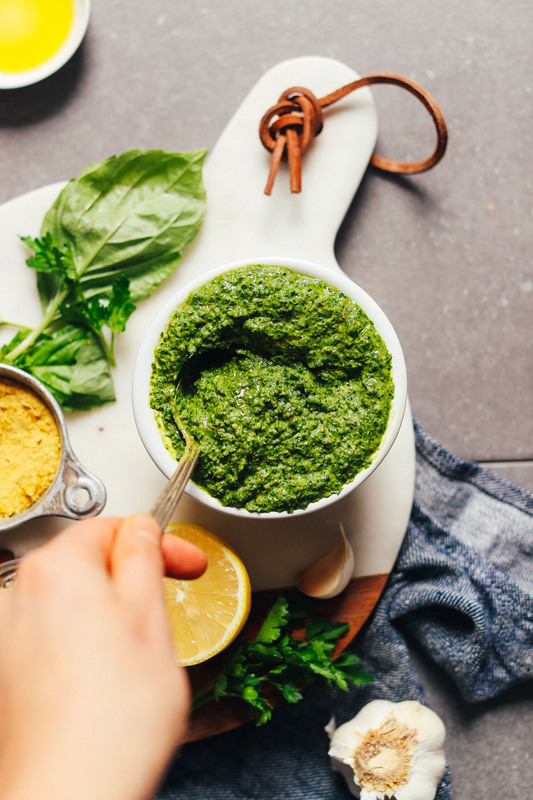 Fresh vegan pesto is ready to enjoy on all the carby things. This would make the perfect addition to pasta night. I suggest throwing it in things like tofu ricotta cheese or almond ricotta cheese before adding to pasta or pizza, adding a dollop to your marinara for even bolder flavor, or serving with Crispy Gluten-Free Vegan Parmesan, Spaghetti Squash Lasagna, or Sweet Potato Lasagna! It would also be delicious slathered on my Garlic Herb Flatbread. Serious yum. If you try this dish, let us know! Leave a comment, rate it, and don’t forget to tag a photo #minimalistbaker on Instagram. Cheers, friends! 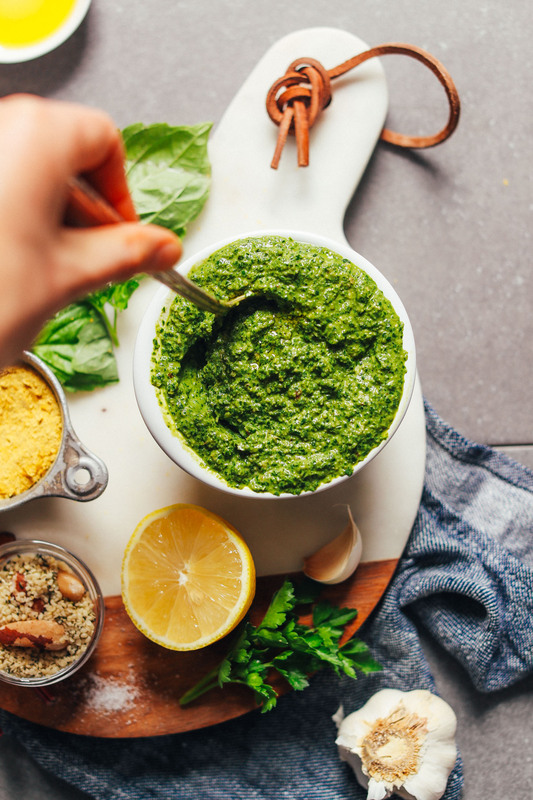 Easy vegan pesto with tons of fresh herbs, nutrient-rich kale, seeds, and nutritional yeast! The perfect 10-minute spread or sauce for Italian night and beyond! Vegan, gluten-free, and oil-free optional. 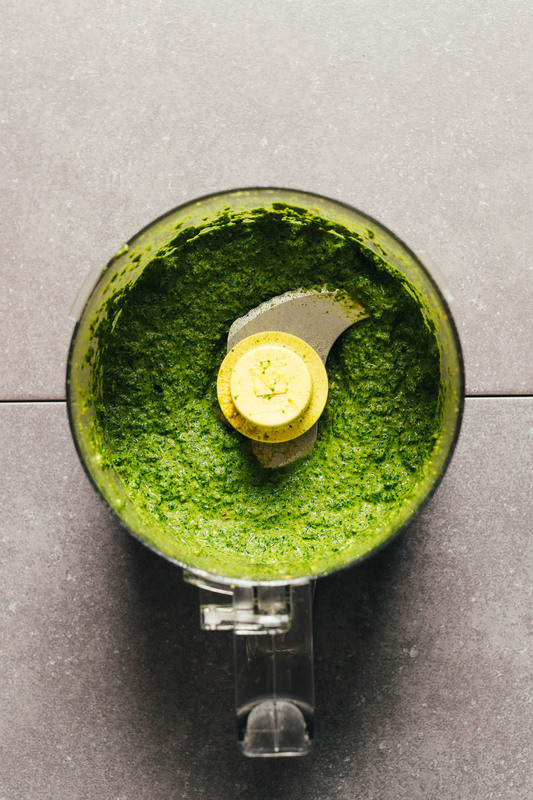 To a food processor or small blender, add the basil, parsley, kale, nuts/seeds, garlic, lemon juice, nutritional yeast, and sea salt and blend/mix on high until a loose paste forms. Add olive oil (or water) a little at a time (streaming in while the machine is on if possible) and scrape down sides as needed. Then add 1 Tbsp (15 ml) water at a time until the desired consistency is reached – a thick but pourable sauce. Taste and adjust flavor as needed, adding more nutritional yeast for cheesy flavor, salt for overall flavor, seeds for “nuttiness” or thickness, garlic for bite/zing, or lemon juice for acidity. Store covered in the refrigerator up to 5 days. After that, pour into ice cube molds, freeze, and store in the freezer up to 1 month or more. *Nutrition information is a rough estimate for 2 Tbsp (1 serving of 8 total) calculated with 2 Tbsp oil.